In this latest Opinion piece, KPMG Global Head of Tax, Jane McCormick, and Robert Phillips, author of Trust Me, PR is Dead, argue that tax can be seen as part of the remedy, not part of the problem. “Responsible Tax thinking and principles”, they write, “enable an important re-set of the social compact, that will in go turn some way to addressing the vexed issue of trust and indeed leadership. CEOs and global leaders therefore would, in our view, do well to think about tax, before they talk about trust.” Tax is Trust, writ large. “Trust” — in business and politics — has been spoken about and even over explained to the point of exhaustion. We have written elsewhere that the so-called crisis of trust is in fact a crisis of leadership — with “trust” often used as an easy proxy for anything and everything that goes wrong and the response being “to re-build it”. But there is no simple way to restore “trust”. Data confirms we live in a low-trust world (politicians, institutions, media, big business) and have done for decades. Any return to a trust idyll is the stuff of dreams. Trustworthiness is the more important lodestar – measured by honesty, reliability, competence and benevolence. We argue that any 21st century institution, including our own, must deliver against these indices to ensure relevance and longevity. Tax is more tangible and an immediate lever. It sits at the heart of the 21st century social compact and the settlement between government, business and civil society. Given that every (profit making) corporation has to pay it, tax is trust, writ large. In this context, it is clear that aggressive tax avoidance has undermined trust in business. And there is a risk that the – not always accurate – reporting of tax issues undermines trust in the tax system itself. We therefore need to develop tax policies that re-balance the many issues that currently bedevil and divide our world: from boardroom and corporate excess, to inequalities between the global north and south; from climate change, to mass population shifts; from a system that enriches business and shareholder elites, to a lack of accountability from businesses to the citizen interests they are meant to serve and from governments for the practical implications of the policy decisions they take. Address these issues and we will go some way towards trustworthiness. 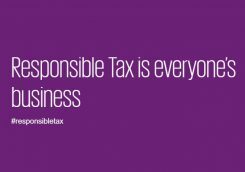 We launched the KPMG Responsible Tax project in 2014 with a singular thought: tax is the entry fee we pay for a civilised society. Without tax, there can be no roads, no schools, no hospitals, no social care. The Responsible Tax project invites contributions from all corners of the debate: left to right; north to south; corporate to activist and NGO; policy maker to expert, academic and media, and everyone in between. Long may this last. Responsible Tax is the responsibility of us all—a civic negotiation, never a corporate imposition. By embracing multiple voices as equals, greater trustworthiness is built between stakeholders. The process is as important as the policies. Responsible Tax speaks to the common good. This is an important aim but not without its detractors, many of whom have (wrongly, in our view) politicised the term. It embraces ancient Greek and Tomasian principles of wisdom and tolerance, fairness and justice — in short measure in the current febrile operating environment, yet central to the concepts of trust and trustworthiness. The emergence of a truly global economy, facilitated by digitisation, allows us to pivot from old to new regimes; imposition to negotiation; social division to the common good. We must urgently replace creaking analogue tax systems and policies that are no longer fit for purpose in the modern age. We can use tax to address the very source of understandable (and increasingly violent) popular discontent – framed within the re-distributive and justice challenges of the UN Sustainable Development Goals. By confronting – and attempting to resolve – societal challenges head-on, we can go a long way towards securing a more trusting environment for us all. We must, however, stay focused on actions, not words. Corporation Tax needs to change, some argue fundamentally, in order to meet the more globalised needs and pressures of the 21st Century. The vital first step – and what the OECD’s BEPS initiative set-out to achieve—creates a global consensus on how to make international tax more cohesive, addressing issues like mismatches, transparency, substance and common anti-avoidance rules. A deeper review is now needed that brings fairness and better balance to the relationship between global corporations, nation states and their citizens—possibly re-assessing the traditional balance of taxing rights between countries and the structural challenges arising from incentives and competition. Tax systems can be re-configured to protect people and planet and place these ahead of pure profit. This includes the introduction of progressive green and consumption taxes, including where the polluter pays, and tax advantages for those supporting the sustainability and responsible business agendas. What we pay, where we pay it and meaningful transparency in the process is vital to restoring trustworthiness in the relationship between business and civil society. Paying tax should be a source of civic pride and responsibility, not part of a closed world of corporate secrecy. Access to affordable housing, and resultant social exclusion and division when this fails, is one of the critical issues of our time (especially in the UK) and demands radical thinking, including whether to introduce an annual wealth tax based on land value. All this is a good example of asking bigger and better questions around what to tax? As business leaders, none of us can escape accountability for the current condition of business and its relationship with civil society; all of us need to play an active part in improving the current condition. We, and the organisations we represent have on occasions fallen short of delivering for the common good and have thus contributed to the trust deficit. We will have to live with our skeletons for some time but we must no longer give room for the pirates – those who seek to resist change and so further, rather than heal, injustice and division. Tax, we believe, can be part of the remedy, rather than the problem. It offers progressive alternatives to the status quo. Responsible Tax thinking and principles enable an important re-set of the social compact, that will in go turn some way to addressing the vexed issue of trust and indeed leadership. CEOs and global leaders therefore would, in our view, do well to think about tax, before they talk about trust. Jane McCormick is the Global Head of Tax, KPMG International and Vice Chair of KPMG in the UK. Robert Phillips is co-founder of Jericho Chambers and author of Trust Me, PR is Dead. They are co-convenors of the global Responsible Tax project.